Gujarat BJP said there is no need to tear the posters, and claimed people have already discarded the opposition party in the state. MEHSANA: A day before Congress vice president Rahul Gandhi's rally here, some unidentified persons allegedly tore the posters put up by his party alongside a road near the city, to welcome him. Gandhi is scheduled to address a public rally here tomorrow. While Congress sees BJP's hand behind the act, Gujarat BJP said there is no need to tear the posters, and claimed people have already discarded the opposition party in the state. 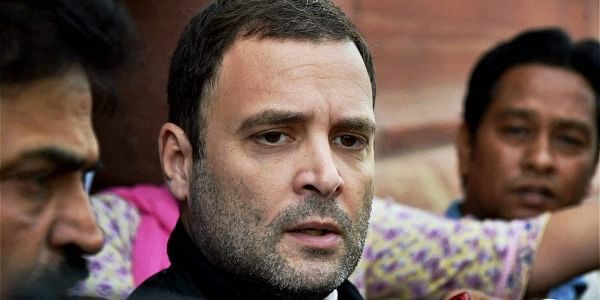 According to local Congress leaders, at least three posters, having Rahul Gandhi's photo, were allegedly vandalised by miscreants early today at different places on Radhanpur-Panchot road on the city's outskirts. Commenting on the incident, state Congress spokesman Manish Doshi blamed BJP for the act. "People of entire north Gujarat are eagerly waiting to listen to Rahulji. There is great enthusiasm among the masses for our leader. It is very clear that BJP could not digest such popularity of Rahulji and indulged in such unruly act of tearing apart the posters," Doshi said, adding that no police complaint has been filed in this regard. Countering the allegation, state BJP's media convener Harshad Patel said his party does not indulge in such acts. "It is not in our nature to tear posters. Why should we do that when people have already rejected them. Tearing posters is something which they do, not us. During Lok Sabha poll campaign in Vadodara, their leader Madhusudan Mistry climbed on a poll and tore apart Narendra Modi's posters," Patel said.